The term “masochism” refers to the condition of deriving pleasure from pain. A masochist is a person who feels pleasure, especially sexual gratification, from receiving physical or emotional abuse. In the film Fight Club (Fincher 1999), the ability to endure violence or torment is marked as a symbol of masculinity. Indeed, the group’s doctrine seems to revolve around the breaking down of one’s body and mind, so that it may be rebuilt into something stronger and harder (or at least more obedient). Self-destruction, through violence, is seen as the road to masculine evolution, while self-improvement is derided as a mark of consumerist culture, and corporate enslavement. A masochist is also someone who submits themselves to the will of another, as the men in fight club submit themselves to its leader, Tyler Durden. This essay will look at the concept of masochism, and examine how it is applied in the film Fight Club. It will analyse masochism as a symbol of masculine development, as a response to the feminisation of modern society. It will also explore the psychology of the protagonist, and how his own masochism develops, and what it symbolises, throughout the film. 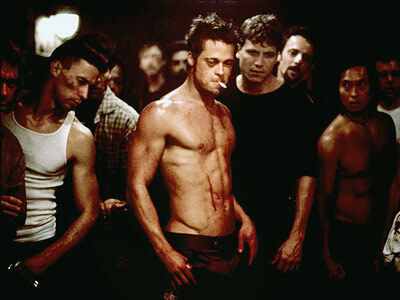 The protagonist of Fight Club, or at least his charismatic alter ego (Tyler Durden), argues that the men of generation x have been softened by the “feminized” and “consumerist” influences of modern society. He claims that modern culture has “striven to immunise men from trauma” and hardship, which has in turn stunted their psychological growth and alienated them from “their essential maleness” (Anask). Instead of encouraging men to face pain and adversity, modern society has taught them to value “emotional growth”, and this overwhelming emphasis on self-improvement has created disillusionment. Men no longer know what it is to be a man, Tyler argues, since they have been largely raised by “single mothers” and taught that self-fulfilment comes from “buying stuff”. Part of the men’s need to feel pain comes from this yearning to pass into manhood. The violence that members of fight club inflict on one another, serves to re-condition the male psyche from consumer to hunter-warrior. The violence is preparation as much as it is masculine empowerment; preparation for the vision Tyler describes towards the end of the film, of a world where men “hunt elk” through the ruins of cities, and masculinity is once again the dominant personae of humanity. But the fights are as much about receiving pain, as dishing it out. The outcome of a fight is unimportant; rather, it is the act of enduring violence that is celebrated and ritualised by the group. At one point, Tyler orders his disciples to go out and “start a fight with a complete stranger”, and lose. This task is as much about empowering ordinary people into exerting masculine aggression, as it is about testing the obedience of his own men, and their ability to suffer a beating. In many cases throughout the film, a character asserts his dominance by receiving pain. In particular, the scene in which the owner of Lou’s Tavern is goaded into beating Tyler half to death, only to retreat in disgust at Tyler’s bloodied face. Upon seeing this, the men of fight club become even more in awe of Tyler, and begin carrying out missions at his behest. Masochism is the driving force behind their doctrine – the male bond asserted through violence, and the submission offered to Tyler, who can endure the most pain of all. Another facet of the protagonist’s masochism is the sense of sovereignty it provides. Jack/Tyler uses violence and self-harm as a tool of self-regulation. He perceives himself to be “solely responsible for succusses and failures”, and feels he “must discipline and torture himself”, as a means of asserting himself; his own independence. Jack is what Freud would call a “moral masochist”, in which authority figures, such as the law and parents, are internalised, resulting in the superego’s punishing and disciplining of the ego. This sub-conscious authority manifests itself, quite literally, through the figure of Tyler. The protagonist of Fight Club represents two halves of the same impulse – the desire to be dominated and abused, and the desire to exert masculine dominance through violence. Both identities desire, yet resent, the other. He is the embodiment of the sadomasochist, and the conflict between his split personalities is projected in the militant, yet subservient demeanour of his followers. What Jack desires most, is his own destruction. Tyler is what Jack wants to be, and throughout the entire film, he is abolishing all the aspects of his former self. First he destroys his condo, and moves into an abandoned house; he quits his job, rejects Marla and his boss; renounces his father and then God. Every layer he peels off from his own skin is about getting closer to his ideal self – Tyler. As he says, he is becoming Jack less and less, until one day he will just wake up and be Tyler for good. This final resurrection occurs at the climax of the film, when Jack simultaneously defeats Tyler and commits the ultimate act of masochism – he shoots himself with his own gun. This violent act merges his competing personalities back into one shell, and consolidates his role as alpha male of the new masculine order. The masochism of the self, preached within fight club, extends to an almost universal level with Project Mayhem. As Tyler whispers to a half-conscious Jack, in the world he sees, humanity has returned to a hunter-gatherer existence, in which men are actually relevant. The endgame of fight club is the destruction of modern civilisation, as seen in the films closing moments, with the financial buildings being decimated. If you take away the debt “everyone goes back to zero”; the rock bottom Tyler refers to throughout the film. The masochism embodied in the members of fight club is extended to everyone, as Tyler seeks to fulfil the freedom promised by “losing everything”.